The lead article in the first issue of The Socionomist is beyond timely. A Socionomic View of Epidemic Disease: A Looming Season of Susceptibility is Part One of an exploration of the mechanisms by which social mood affects our psychology, physiology and susceptibility to epidemic disease. It has been in the works for months. Part Two will publish in June. Social mood governs a plethora of human social activities, from stock markets to the economy to societal health. For example: as measured by the stock market, we recently completed a large wave in a powerfully-negative social-mood trend. It bottomed amid extremely pessimistic sentiment. Social stress reached higher levels than it has in decades. Soon after, H1N1 swine flu erupted and came right to the edge of being a pandemic. If this was the only such instance of disease breaking out after a social-mood decline, it might be coincidence, but there are numerous examples in the historical record. 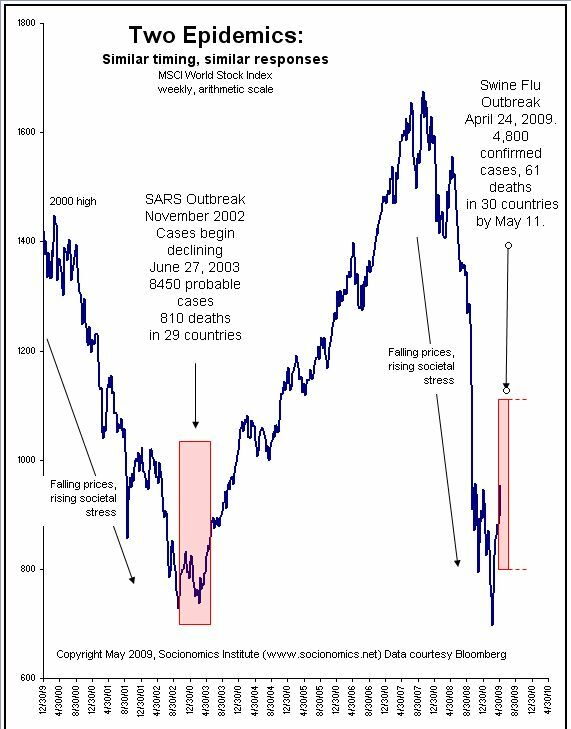 As you can see in the chart of the MSCI World Stock Index below, there are similarities between the 2003 SARS epidemic and today’s flu outbreak. This chart is not in Part One of A Socionomic View of Epidemic Disease in the brand-new inaugural issue of The Socionomist. We didn’t need it. We have five other charts that show the strong connection between negative social mood and increased human susceptibility to epidemics.